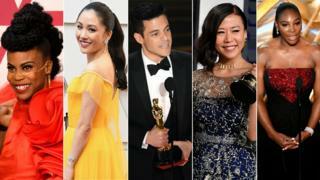 Other than crazy red carpet moments and glamorous gowns, the Oscars is often a chance for actors to inspire fans with their speeches. Some call for social and political change, like Spike Lee who exhorted the audience to “mobilise” ahead of the 2020 US presidential elections. Others, like Olivia Colman, take the time to thank their nearest and dearest. Here are some of the most inspiring moments of the night. Hannah Beachler made history as she became the first black person to win the Oscar for production design, for her work on Black Panther with Jay Hart. She thanked director Ryan Coogler for giving her “a safe space” and “brotherhood”, and she had a message for the next generation. “I give this strength to all of those who come next, to keep going, to never give up,” she said. Fellow Black Panther crew member Ruth E Carter also made history for being the first black person to win an Oscar for best costume. An African-American woman had not won an Oscar in a non-acting category in more than 30 years. With Ruth Carter and Hannah Beachler, two just won in 5 minutes. When chatting to Ryan Seacrest on the red carpet, Wu described Crazy Rich Asians as a “historic” moment, as it saw a major studio telling a story centred on her experience as an Asian-American. As Rami Malek accepted his award for best actor for his performance in Bohemian Rhapsody, he said the film might offer hope to those struggling with their identity. He also embraced being “the son of immigrants from Egypt” and a “first-generation American”. Chinese-Canadian animator Domee Shi collected an Academy Award for best animated short for her directorial debut, Bao. The Disney-Pixar film resonated with many Asian communities around the world for representing their culture and heritage. In her acceptance speech, Shi gave a shout out to all the “nerdy girls” in the world. “To all the nerdy girls out there that hide behind their sketch books, don’t be afraid to tell your stories to the world!” she said. While Serena Williams may not be an actress or singer, she knows a thing or two about what it’s like to become a star. Some viewers thought the final part of her speech referred to her friend the Duchess of Sussex, who stood down from her role in legal drama Suits when she got engaged to Prince Harry.